Bring back nature to the soil with the power of MK bacteria. 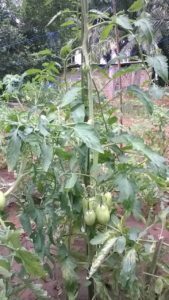 Grow delicious fruits, colourful flowers, safe and nutritious vegetables. 100% naturally organic. 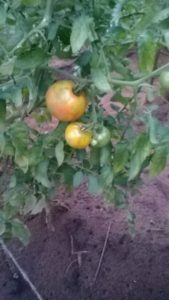 N-100 “DOKI DOKI” is a 100% naturally organic soil revitalizer, manufactured wit h our special blend of ingredients such as MK bacteria, negative ions, tropical enzymes, rice bran, smoked rice husk, and fermented poultry manure. MK bacteria are a colony of beneficial, hardworking micro-organisms, which resulted from 40 years of research and improvement using our special culture method on micro-organisms such as bacteria, yeast, filamentous fungus, and root nodule bacteria. When constantly applied to the soil, the revitalizing liquid N-100 “DOKI DOKI” breaks down pesticide accumulated in the soil, converts acidic soil to alkaline, which is more suitable for plants, and improves the soil conditions such as aeration, water retentivity, and permeability by making the soil soft and aggregated. In addition, since the product contains well balanced micro-nutrients, plants can grow healthily. With these effects, fruit grows ever more delicious, flowers more colourful, and vegetables safe and more nutritious. Shake the container well, dilute the concentrated liquid at a 1 to 50 ratio, apply once to 3 times a week. Adjust the spray period and dilution ratio (50-500) depending on the growth conditions of plants. The best suited water for dilution is rain water and spring water, and tap water should be set aside for 2 to 3 days before using for better results. Over application does not cause harm. The ingredients are 100% organic, non-toxic and safe. Contact with human bodies is not harmful. 1, Keep in a dark, temperature-stable environment. 2, Occasionally leave the cap open as the container may swell due to the bacterial activities. 1, Soil revitalizer liquid N-100 “DOKI DOKI” is not for drinking. 2, Keep out of reach of children. 3, Also pay attention to daily cultivation management such as watering. 4, Sediment is part of the ingredients and will not cause any problem even when mixed in the spray liquid. 5, When the dilution ratio of the concentrated liquid is less than 1:50, plants may be damaged. 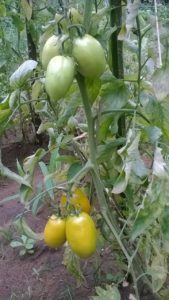 These are tomatoes.When we use N-100, the plants grows faster, and the leaves get dark green more than the plants without N-100. Of course, the fruits are more delicious and sweet ! 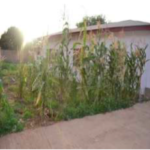 In November 2015, a test bed was prepared in Zooline area, Sokoto and local seeds (non-improved) were purchased from Sokoto market and the seeds (maize, millet etc) planted, to verify the effects of the product. The test bed was divided into 2 parts and the N-100 was applied immediately after planting – approximate ratio used 100ml diluted using 50ltrs of water. N-100 was applied twice a week for a period of 3 to 4 weeks. 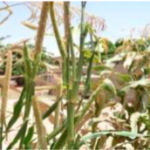 the maize and millet with N-100 have 2 to 3 cobs/yields per head, which is not usual in Nigeria. 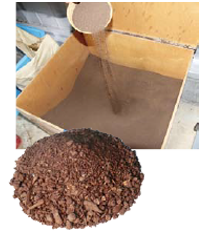 MK109 is a soil revitalizer, manufactured with poultry manure, rice bran, fumigated charcoal, and fermented completely for half a year. The MK bacteria in MK 109 and N-100 decomposes organic matter, breaks down pesticide accumulated in the soil, and converts acidic soil to alkaline which is more suitable for plant growth. MK109 also helps plants to grow easily, decreases disease and brings out the natural sweetness in fruits. Continued usage of MK-109 ensures that soil remains fertile and rich in essential nutrients for years. 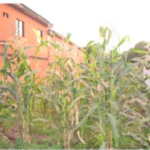 Less fertilizer is required in subsequent years, making it more economical. 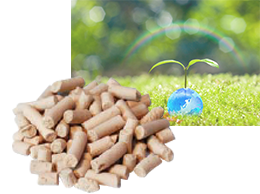 Porous Bio-ceramics is biodegradable, and returns to it natural form as soil in several years. It is manufactured with more than 20 components including magnesium, sulfur, chlorine, manganese, aluminum, zinc, iron etc. Porous Bio-ceramics does not only have high water holding capacity, it also helps in maintaining soil structure by increasing its nutrient holding capacity. Porous Bio-ceramics can be used in any farms including fish farms and fish shelters. It can also be used in rivers and ponds to purify water. After graduating from Waseda University’s specialized school, Osato joined the Imperial Household Ministry, and conducted botanical research. After the war, he obtained a number of patents, introduced products in tie-ups with manufacturers including Mitsui Bussan Machine Sales and Nippon Steel. 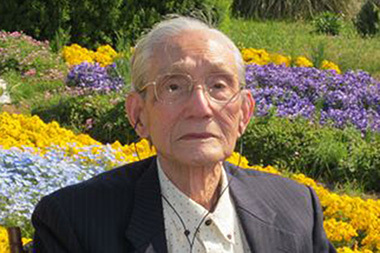 Osato has been conducting research on microorganisms for many years, as part of which a biotechnology-based fermentation plant was constructed and the production of a special organic fertilizer was established. 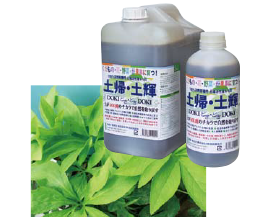 100% naturally organic soil revitalizer liquid N-100 “DOKI DOKI” is a product developed by applying Japanese fermentation technology based on 40-year research and refinements in attempt to revive the now-lost microorganism population called Thomas bacteria. Copyright © 株式会社ＭＫ技術研究所 All Rights Reserved.